IMCA has published guidelines on a range of topics relevant to marine operations; one of these is the Common Marine Inspection Document (CMID), used for inspecting vessels, which formed the basis of this project. The project comprised of two parts, a web application and a desktop application. 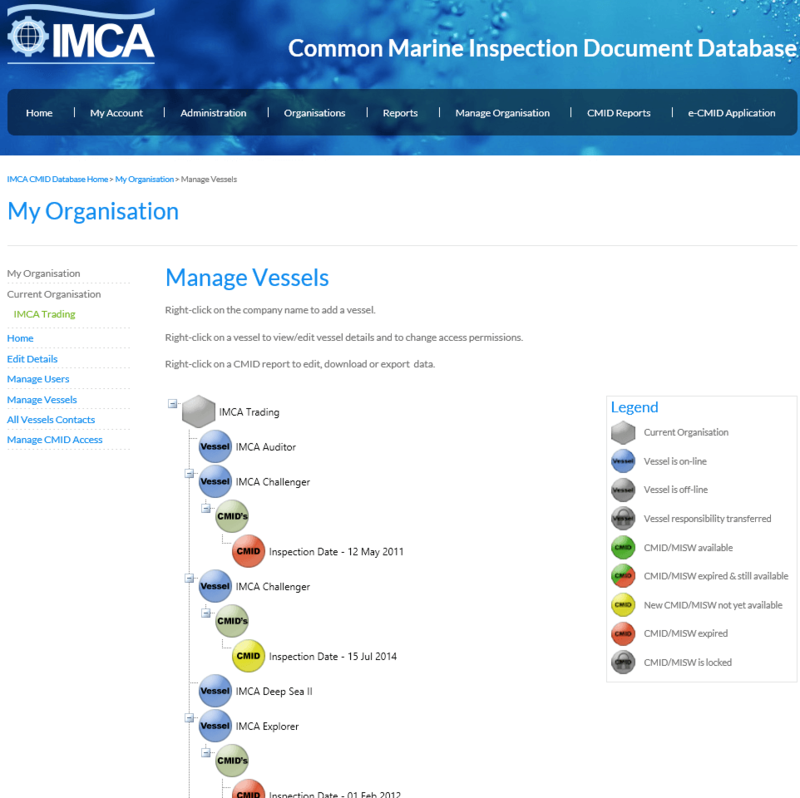 The web application provides members with the facility to register and manage their organisation and any vessels (together with CMID’s) and display them graphically for other members to view. Vessels can also be transferred between organisations. IMCA have full editorial control over the CMID, content of web pages, 27 system emails and styling of the entire site via the bespoke content management system. 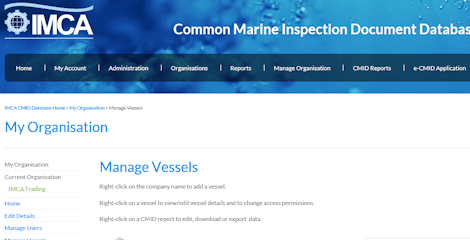 The desktop application can be downloaded by inspectors and is initially used ‘on-line’ to communicate with the web based SQL database and thereby download the latest CMID template - the application can then be used off-line to carry out the inspection of vessels anywhere in the world. When the inspection is completed and an internet connection is once again available the CMID is uploaded to the database and a notification email sent to the Vessel Operator. Once the CMID has been reviewed by the Vessel Operator it is made available for viewing by subscribed members. IMCA’s specific requirements were for a web application with the look and feel of their main website (albeit with one or two subtle modifications). Acumen worked closely with IMCA to achieve this and, we are happy to say, everyone is very pleased with the finished result. Acumen provided an excellent, robust product which dealt with some complex requirements in a timely, efficient manner. They have continued to provide friendly, professional support and have proven to be very responsive to changes and new requirements that have arisen since initial delivery of the product.